We've decided to start a new thing. Every week (probably), we'll post a picture and let you folks at it. The best caption wins, and commentary is welcome too. If a discussion around a pic blows up, we might even hijack it for a future "ParaRiffs" or other feature of the magazine. 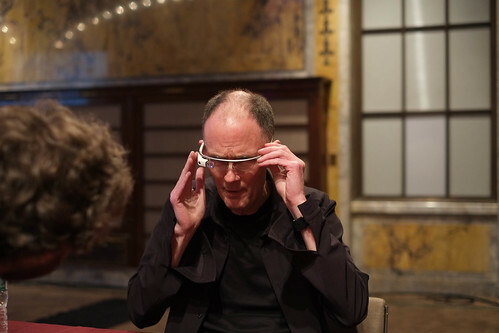 This week, it's a rather surreal pic of cyberpunk forefather William Gibson trying out Google's new Google Glasses. When the day wraps up, we'll pick the best caption (from here, the FB page, or Google+) and sign up that lucky luddite for a digital subscription of Pravic. I'll also post a few comments of my own.